It’s been great being able to work on SongMeanings during the day and have time at night to work on projects around the house. Just a few weeks ago, it was working all day at Corporate America, coming home exhausted and working on SongMeanings as much as I could until my eyes got too tired and strained. It was nearly impossible for Rebecca and I to really get anything accomplished house-wise during the week. My schedule has been roughly 8:30-5:30 dedicated to SongMeanings and the business; mostly coding away on new features and taking a few conference calls. At night, it’s been a mix of things — still working on SM, calls with the business partner, spending quality time with Rebecca when she’s not blogging (err on Pinterest), annnddd building the office window seat. 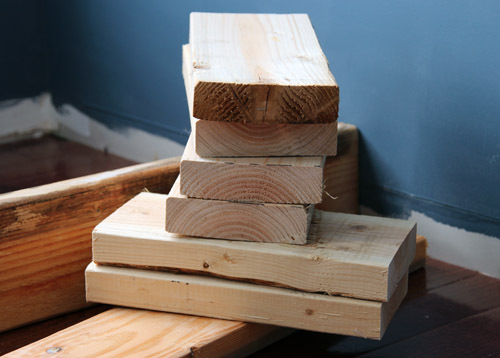 This weekend, Rebecca and I picked up some lumber from Lowe’s; three 12-foot 2×6 boards. The car ride home was quite funny with a good foot of wood sticking out of the trunk. Rebecca was paranoid as can be thinking a) we’d kill ourselves or b) we’d kill someone else. I kept telling her I’ve seen my father do much worse and be successful, but for some reason that didn’t exactly comfort her. I cut two of the boards to be able to span the entire width of the wall, or just under 12ft. With the remaining piece of 2×6, I cut out eight 12-inch pieces. These would connect the long boards to essentially make up the frame. I used wood screws to screw the boards together. There was conflicting information online on whether to use nails or screws when building a frame. Some said nails allow for flexing while others said screws would be more reliable. Using the screws were fairly easy; the hardest part (or tedious rather) was continually drilling pilot holes. 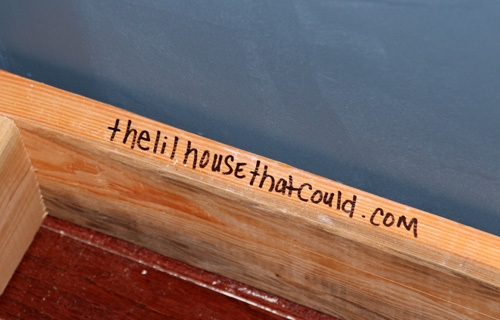 And for fun, I decided to write our lil domain on one of the planks. I figured if someone ever dismantled this thing and the blog was still operating, he or she could then contact me to ask me what the heck I was doing building this thing. I’m still asking myself that same question. I also wrote when we started the project. But the world is going to end in a few short months, so I’m not quite sure why any of this mattered. We wanted to install puck lighting on our built-ins much like the inspiration above. We had an existing outlet centered on the wall which I could tap into. The only problem was actually running the electrical wire through the studs and up the wall. I discussed the plan, and route, with several friends. When one of them told me to stop being wuss and do it already, I took the leap. After a couple of hours that spanned two nights, a dozen or so curse words, getting shocked once and causing some open wounds, I finally succeeded in running the wire — all within code, too. Phew. The idea was to get an outlet at the very top of the bookcase and then use the variance to hide the additional wiring for the puck-lighting. That wire you see on the cabinet (isn’t live) and is just extra cord. I’ll be trimming that down to fit into the outlet — or as seen below. 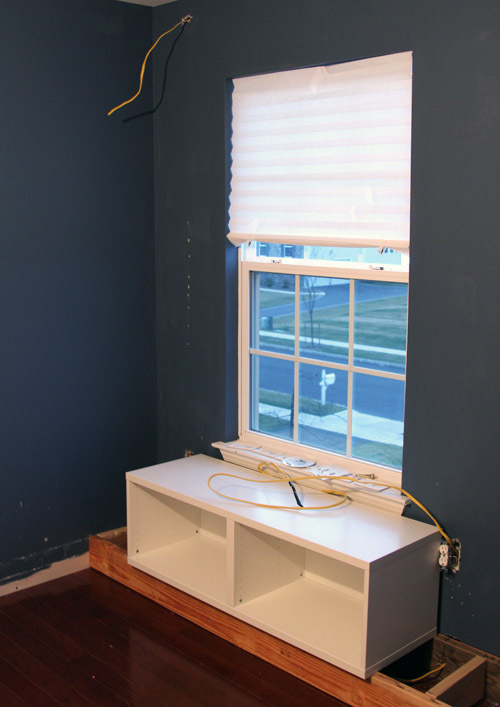 One issue I ran into, and it was one we were expecting, was the molding on the window sill. The cabinets come up too high, so we’ll be removing them shortly. 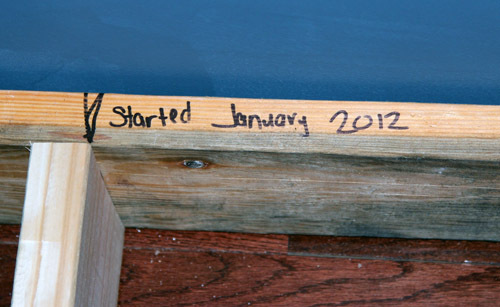 I was expecting when I finished the frame and rested the cabinets on it, it would not be level. But best thing ever? I put the level on it and sure enough, it was damn near perfect on both sides. 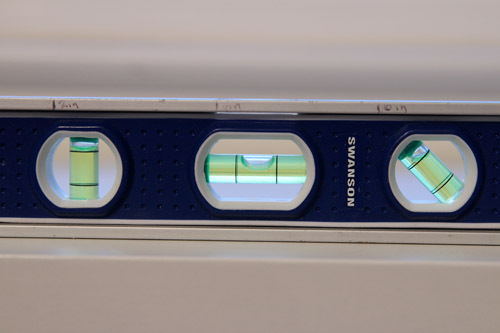 I was assuming I’d have to use shims to get this puppy level. I’m not sure how I accomplished it being level, but hopefully it makes the rest of the project much easier. Attach the frame to the studs in the walls for a secure fit (right now the frame is just resting in there). 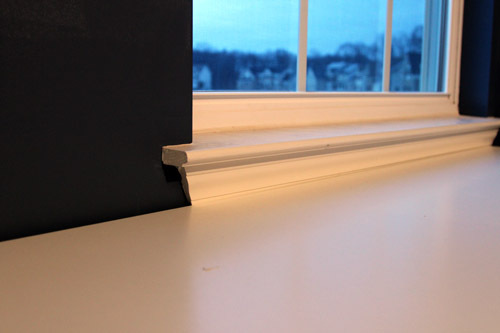 Remove the molding from the window sill. Start building the open boxes which will sit on side each of the cabinets against the wall. I love that you guys are raising the BESTA boxes up. This is going to look so good when everything is finished!! I’m so excited to see how this turns out when it’s finished! Awesome job so far! Love how the kitties somehow make it into every post. I love built-ins so much! I can’t wait (seriously though) to see it finished! I can’t wait to see the finished product also. 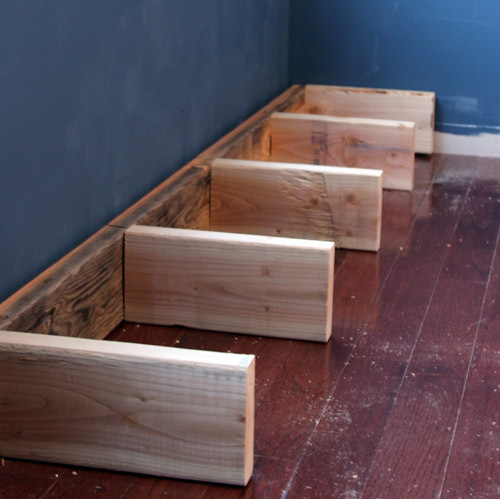 I would also really love a built in bench and I have been scouring the online forums to see other people’s ideas. It seems that you are very familiar with Ikea. So I am wondering if you could tell me if we could paint over Besta units so that our bench can match our Besta Wall Cabinet in the bedroom? Have you had any experience in painting Besta Cabinets? I stumbled upon your site looking for ideas for built in bookshelves. 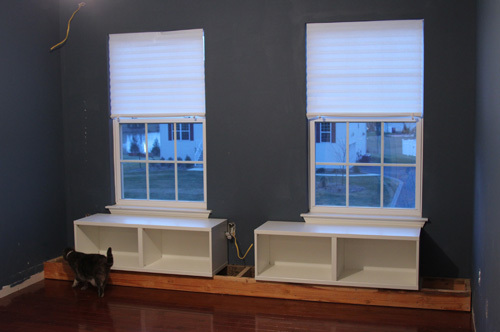 I like how you framed the window with bookcases and bench seat. You said that per drilling pilot holes is time consuming, and I agree. If I may give you a suggestion/tip, if you lube the tips of your screws or nails with oil or liquid soap, they will sink into wood much easier. I’ve got this tip from an “old carpenter” my grandfather. It works great.